Are you bananas for brioche yet?!? 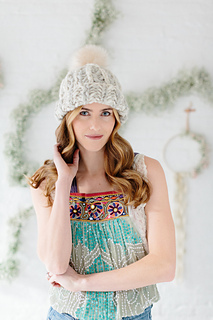 If not, this simple hat pattern is the perfect way to dive in and give it a try! The contrasting stitch detail is simply stunning. And we even have a matching scarf pattern to this hat if matching is your thing. Follow along on my youtube channel with a simple how to video and let’s master this stitch together. We knit our sample in contrasting Spun Cloud Yarn colors - Fog Heather & French Vanilla. Follow this link to see our video on how to knit this stitch too - this video is specifically for the matching Joie Brioche Scarf Pattern.